Michael Strahan has tackled something few football stars have attempted — Broadway. The gap-toothed co-host of “Live with Kelly and Michael” made three short appearances at Wednesday's matinee of “Elf” and said he has new respect for Broadway performers. Fans can see a behind-the-scenes recap on Thursday’s TV show. The musical is adapted from the Will Ferrell film from 2003 about Buddy, a human raised in the North Pole who travels to New York in search of his parents. Strahan thought making his Broadway debut would be fun and represented a new experience for a guy who holds the single season sack record. He found himself more nervous than he has been for high-stakes football games or live TV. “It’s a little nerve-wracking because so many people depend on you, you want to get your line across and you have to play to the crowd. It’s a lot more intricate with everyone hitting their marks. You don’t want to be the guy that messes everyone up,” he said. 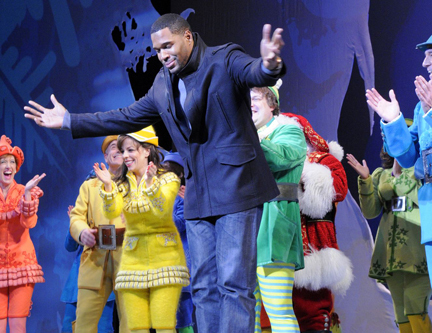 Strahan, 41, played both a police officer and a Salvation Army Santa in the first act and later came on as himself in a scene with the real Santa in the second act. As he waited in the wings of the Al Hirschfeld Theatre, he saw the toll the musical takes on its dancers. Strahan rehearsed for an hour in the morning with stage managers and associate director Casey Hushion. At 1 p.m., some in the cast came in early to work with him, including Jordan Gelber, who plays Buddy, and Beth Leavel, who plays Buddy’s stepmother. The audience was quiet when Strahan first appeared as an officer with another cop after Buddy gets kicked out of Macy’s. But the seven-time Pro-Bowler and Super Bowl winner flashed his trademark smile and they went wild. More applause greeted him after he played a Salvation Army Santa as he and Buddy wrestled over the kettle bells. In the second act, he waited to ask Santa for a present. Santa asked him his name, the newly minted actor said “Michael Strahan” and he then asked for a red Schwinn bicycle with a bell shaped like Miss Piggy. The crowd cheered when Strahan identified himself and he got another wide round of applause at the curtain call, where the cast gave him flowers.